Orange and chocolate, we get along juuuusst fine. From the old Mocha Valencia days at Starbucks to the current seasonal deliciousness of Terry’s Chocolate Orange, I can’t get enough of the pairing. 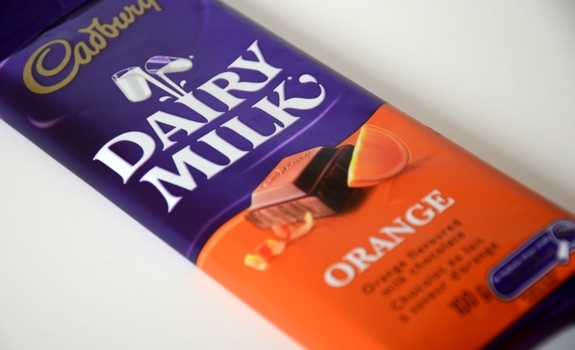 While I’ve tried Dairy Milk in the past, I’ve never sampled their orange-flavoured bar. A crazy sale price at Safeway convinced me to give one at try. The Pitch: “Orange flavoured milk chocolate.” I guess you’re supposed to know what you’re getting. It’s a Dairy Milk bar with orange flavouring added. Also, “To be enjoyed as part of a healthy, active lifestyle.” ie. Don’t blame us if a year of eating chocolate while sitting on the couch watching cartoons results in your having to buy a new belt. The Look: Straight forward. Old school Cadbury and Dairy Milk logos on a purple foil-plastic wrapper, with a square of chocolate and a slice of orange to, uh, illustrate what you’re getting. 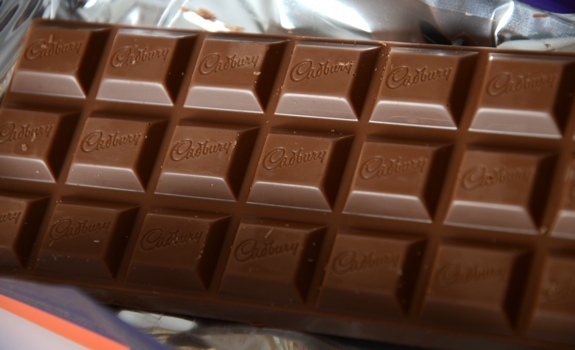 The bar itself is divided into 21 squares, and the look of the chocolate doesn’t hint at any orange taste. The Taste: Open the package and bam, orange aroma. A nice greeting, that. The milk chocolate is very sweet and creamy, but the flavour you’ll notice most is the intense burst of orange. It tastes like the smell of a freshly peeled orange, and the citrus lingers for ages in the mouth, long after the chocolate has melted away. For a grocery store chocolate bar, this is a very nice find. Cost: $1.25 on sale at Safeway in Calgary. Value for cash money: At that price, great. Nutrition? : Per 9 squares (43 grams): 230 calories, 13 grams of fat, 30 mg of sodium, 1 gram of fibre, 3 grams of protein. If it makes you feel any better, it’s also got 10% of the daily value of calcium, as well as a bit of iron and vitamin A. The verdict: For $1.25, a steal of a deal. At twice the price, still a good buy. It has a lovely soft texture that melts easily in your mouth, and the strong orange flavour doesn’t pull any punches. Chopping up one of these bars would add some pizzaz to chocolate chunk cookies. 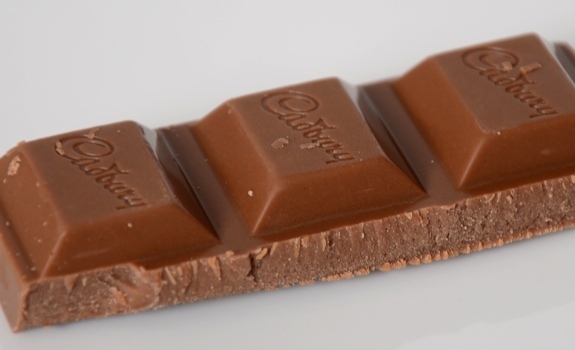 Squares from a Cadbury Dairy Milk Orange chocolate bar.